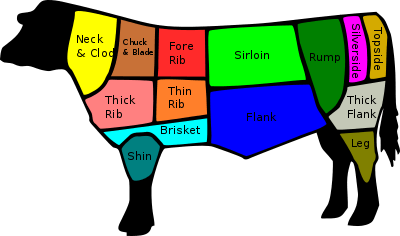 The bottom sirloin steak is a steak cut from the back of the animal below top sirloin and above the flank. The meat is often used to cook the tri-tip and flap steak. The meat is considered lean and chewy. ↑ "What Is Bottom Sirloin? (with pictures)". wiseGEEK. Retrieved 2015-09-23. 1 2 Severson, Kim (28 October 2014). "Santa Maria Tri-Tip Recipe". New York Times. Retrieved 2015-09-23. ↑ J. Kenji Lopez-Alt (24 May 2012). "The Best Inexpensive Steak For The Grill Part 4: Flap Meat (Sirloin Tip)". Serious Eats. Retrieved 2015-09-23.